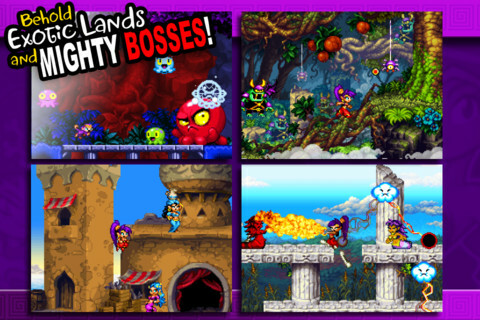 When it was initially released for DSiWare last year, Shantae: Risky’s Revenge [Free / $2.99 IAP], was an underappreciated gem on a service that most people didn’t bother using. Now, thankfully, the game might find a little more grounding with the wider release on iOS, but as we’ve seen time and time again, platformers are a difficult sale on touchscreens, and Shantae, despite its pedigree, will have to keep up. 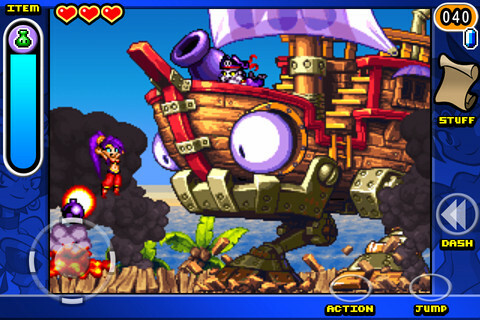 The game is a sequel to the Shantae, which was released for the Gameboy Color well into the rein of the Gameboy Advance. It follows the story of the belly-dancing, hair-whipping Shantae, as she seeks out her arch nemesis, Risky Boots, in order to get a magical lamp. As a game, Shantae takes most of its cues from Castlevania and Metroid, meaning it’s essentially a large, open-world 2D platformer, where gaining certain transformational powers will unlock new areas. You’ll be able to turn into a monkey to scale walls, an elephant to pound rocks or a mermaid to swim underwater. As you discover new powers, you’ll be backtracking and searching out new nooks and crannies to explore. On top of those powers, you’ll also get magic spells, which are purchasable in the main hub town, and performance enhancers, which enable you to attack faster, stronger and more. Most interesting is its introduction of a somewhat three dimensional plane, where each smaller 2D area has several levels to it — like a stack of papers with levels drawn on them — you’ll bounce forward and backward through each section. It’s too bad they’re not used more throughout as it’s truly the most interesting addition to the genre. It’s all rather clever and the level design keeps up, which is a good thing, because in general, most Metroidvania games we’ve seen so far have been lacking in their ambition. Unfortunately, you won’t find guides of where to go and the maps in the game are terrible and unhelpful — Shantae is all about exploring and figuring things out for yourself. This is frustrating at points, especially when you’re at a loss for where to go next, but the reward for finding your own way often makes up for it, even if it does make it so you never feel like your properly progressing. Despite its clear influences, it’s not derivative of either of the above games, and mostly forges its own path while maintaining the feeling of a good homage. Most frustrating is the lack of a quicksave option, and the fact the game has a tenuous relationship with multitasking, working seemingly at random, doesn’t help. I’ve complained about this before with iOS games and you can call me weak for doing so, but when playing on a mobile device, I’d like a quicksave option for when I need to put it down for a moment — even if it’s just one slot, a bookmark to come back to but not exploit. There’s also an option for iCloud saving, but it doesn’t appear to be working at the moment, but thankfully, the IAP of the full game has no problems transferring from device to device. Visually, the game is hit or miss. It’s weird to say, but the game actually looks better on the lower-resolution DSi screen, because the pixel matching feels more natural. On retina display, the it looks a bit muddy and it isn’t helped by the hideous bright-blue border around everything. It looks even worse on an iPad, like a blown-out tiny image. Despite itself, it still manages to be passable on the quality of the animation alone. WayForward has a way with 2D platformers that few developers can imitate and even through the pixels don’t look quite right, the game itself never feels gaudy or horrible and you’ll quickly get used to it. I don’t think they needed to invest in making everything a higher resolution, but I feel like the emulation of the pixels could have been a little more clear, especially considering the border around the game screen and characters are all converted up. The sound too, is worth mentioning. Jack Kaufman’s soundtrack is like something pulled straight out Aladdin, with a chip-tuned, Middle-Eastern vibe pushing you along the whole way. The game was created to look and sound in the vein of SNES and Genesis classics and it succeeds in nearly every way. Unfortunately, it’s still a platformer on iOS and the virtual controls will never have the tuned accuracy of a physical stick. It does feel like the game was loosened up a bit from its DSi counterpart to correct this, although since Nintendo doesn’t allow for downloading older games onto a different device, I can’t redownload the DSiWare version to confirm this. It’s certainly a bit easier than most of the games that inspired it, which is nice considering the controls aren’t as precise as they need to be. For what it’s worth, the virtual stick works as well as it can, but can’t be customized or moved, so if your hands don’t conform to where they’re at, you’re out of luck. If you don’t have a DSi or 3DS, or you just don’t want to plop down $12 to play on those systems, Shantae: Risky’s Revenge is a solid port, but marred with the same problems we’ve come to expect on iOS. It’s certainly one of the better virtual control schemes and you’ll only occasionally find problems with it, especially when required to jump and attack, but overall, it retains the engaging gameplay from the original.